The Longest Journey (2000) 4 CD set by FunCom - When playing the game on a Win XP system, the game may lock up at the start of chapter three. This is the point in the game where April Ryan enters the police station. As soon as she enters, the game will freeze and you’ll get an application error box. You may have to use ctrl+alt+del to get out of it and in some cases you may have to reboot the computer manually. Tip - To fix the problem, first make sure you’re running game in compatibility mode for Win 95/98. 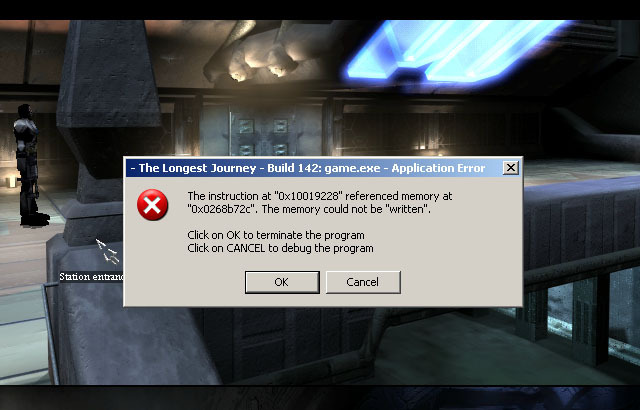 In the Longest Journey folder, right click on game.exe —> properties –>compatibility. 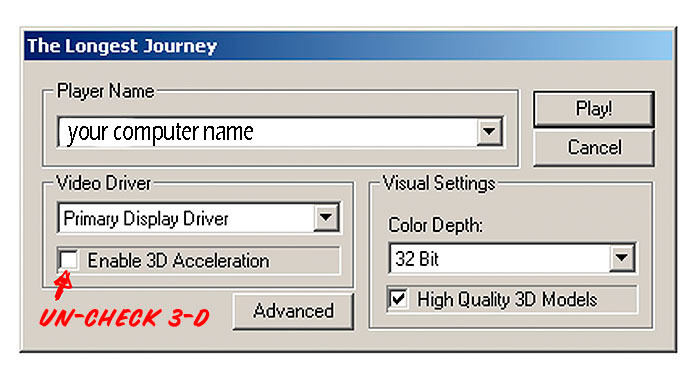 Set compatibility mode to Windows 98/Windows ME. Then click on game.exe to start the game. A grey Windows box will pop up with options (see photo) In this window un-check 3D acceleration. This should solve the problem and allow you to get into the police station without crashing the game!